By protecting concrete pillars with a ready-to-stick wrap developed by Nanyang Technological University, Singapore (NTU Singapore) and JTC, existing structures can be easily repaired and reinforced to extend their lifespan. This new technology is especially useful for urban cities to rehabilitate aging infrastructure, including buildings and bridges that may have developed issues such as cracks and delamination of concrete. This new wrap called FasRaP—short for Fast Wrapping Fibre Reinforced Polymer (FRP), is jointly developed by scientists and engineers from NTU, JTC and Prostruct Consulting Pte Ltd.
FasRaP is created using commercially available glass fibres, but with a proprietary glue-like resin developed by NTU materials scientists which acts as an adhesive for the wrap. The unique feature of the resin is that it will harden only when exposed to light, making it possible for it to be pre-applied in the factory and packaged into a ready roll of sticky wrap, similar to double-sided tape. At the work site, FasRaP is ready for application directly on the wall or pillar. Only three workers are needed to complete the job, compared to FRPs currently available in the market which typically require a team of up to six workers to install, as the conventional resin needs to be manually applied on site. Apart from halving the time and effort needed for installation, prefabricating FasRaP with resin glue in the factory also ensures consistency in quality since conditions can be better controlled and monitored compared to manual application of resin on-site. In industry-standard blast tests and load tests, FasRaP has proven to be just as strong as conventional FRP. 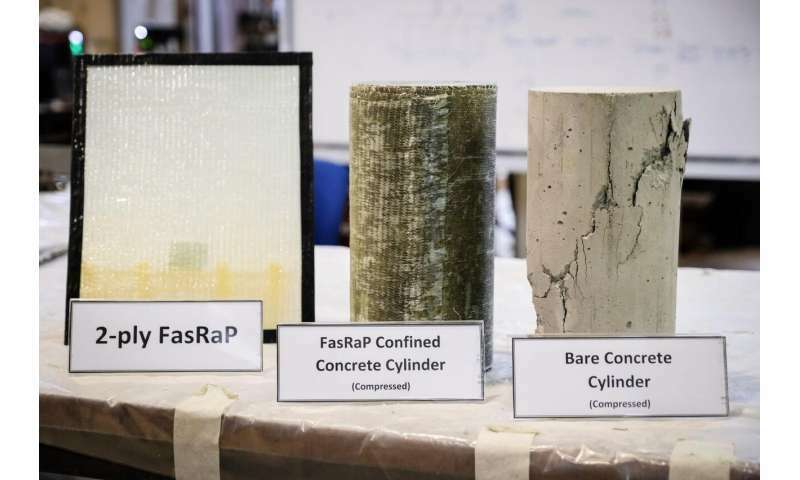 Comparing a bare concrete pillar without reinforcement and a pillar wrapped with FasRaP, the tests show that the latter can withstand an additional 80 per cent load. 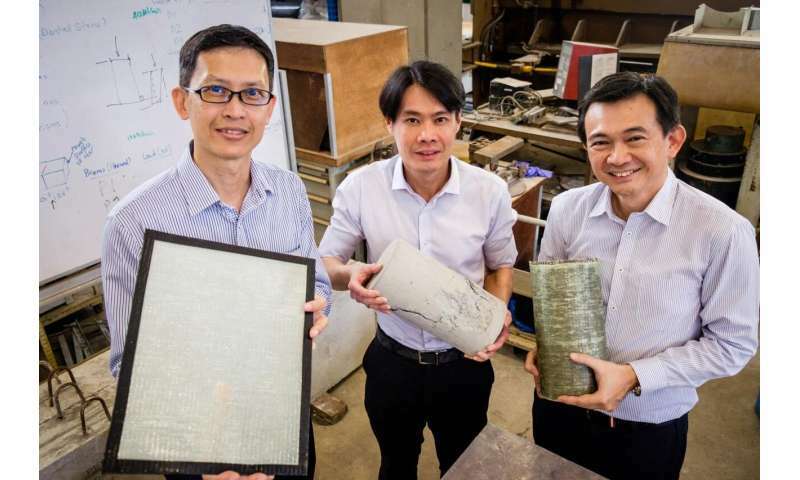 Associate Professor Ng Kee Woei, lead project investigator from NTU's School of Materials Science and Engineering, said, "Our invention allows companies to save on manpower costs, increase efficiency and make structural reinforcement much easier to execute. This will help them to meet future building standards and prolong the life of older buildings and structures as Singapore and other urban cities age." Mr Calvin Chung, group director of engineering at JTC, said, "By combining our engineering knowledge, NTU's research expertise and Prostruct's industry know-how, we can address real challenges faced by the construction industry such as manpower constraints and quality control. The development of new advanced materials such as FasRaP will help us meet the growing demand for the repair and rehabilitation of aging infrastructure in Singapore by significantly reducing the time and improving the quality of installation, thereby increasing productivity and cost efficiency." Dr. Ang Choon Keat, founder of Prostruct Consulting Pte Ltd, a specialist professional engineer and certified blast consultant, was involved in the project as a co-investigator. He added, "Besides reinforcing existing structures, we have also conducted blast tests and demonstrated that FasRaP is suitable for strengthening any structure against blasts. This is an important application in view of the Infrastructure Protection Act passed by the Singapore Parliament in October 2017." The joint research team is now working to commercialise their technology, which has intellectual property protection in the form of a technology disclosure filed through NTUitive, NTU's commercialisation and innovation company. They are in talks with both manufacturers of FRPs and industry contractors using FRPs. To accelerate the adoption and commercialisation of this new technology, JTC will identify suitable infrastructure projects to deploy FasRaP. This invention highlights the capability of the tripartite research partnership between a government agency, industry and academia, to generate new solutions to tackle challenges in the building and construction sector. Established in 2011, the NTU-JTC I3 Centre aims to pioneer cutting-edge industrial infrastructure solutions to address challenges faced by Singapore and its companies in areas such as safety, productivity, as well as manpower and resource constraints.